In the cool, early hours, before the unrelenting sun rises over the Sahara, humanitarian workers leave Niger’s capital, Niamey, and set off for an assessment mission to the border village of Sinegodar, which is close to the Mali-Niger border. The village is a four-hour drive on a bumpy, desert road from Niamey. Until recently, only 1,500 people lived in Sinegodar. Today, conflict between rebels and Government forces in northern Mali has forced tens of thousands of people to flee across the border and into a country facing a humanitarian crisis of its own. Across the Sahel, a region-wide drought threatens more than 10 million people with food shortages this year, and in Niger more than 5 million people are struggling to find enough to eat. 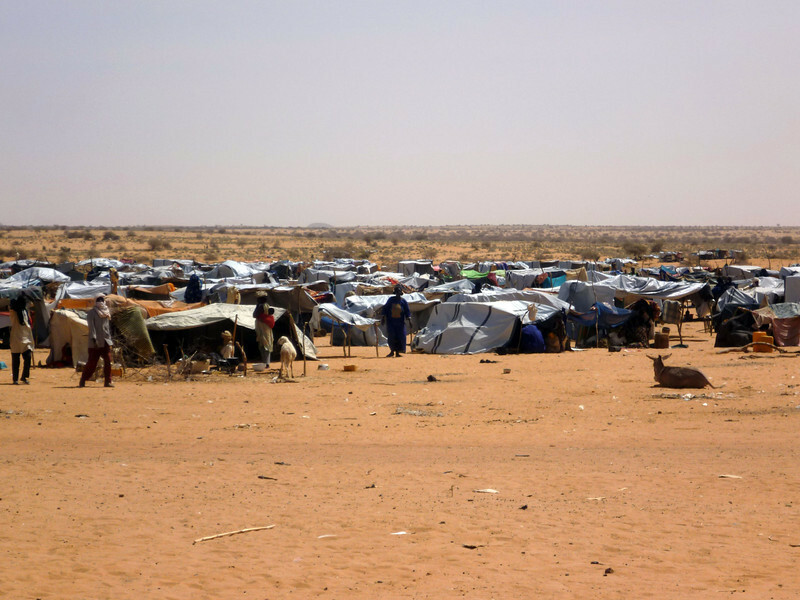 The arrival of thousands of Malian refugees is making life even more difficult. 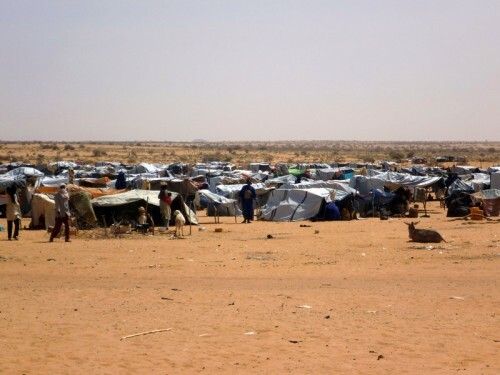 Most of the refugees are staying in temporary sites in areas that are badly affected by drought and poor harvests, exacerbating water and food shortages. The 7,000 refugees, who have settled into make-shift camps in Sinegodar, urgently need food, shelter, water and sanitation. In the village, an inhospitable desert area where water is scarce, UNICEF is providing drinking water through water tanks and bladders. “The refugees arriving from Mali have added to the number of people relying on scare food stocks in Niger,” says Olivier Eyenga, OCHA Humanitarian Affairs Officer. But in these hard times, the people of Sinegodar have welcomed their new guests. For this, Agaly Alkassoum is grateful. Agaly is an English teacher from the Malian town of Menaka. He arrived with his wife, children and extended family after rebels destroyed their property and forced them to leave their homes. “I never thought that one day I would be a refugee,” he says. His wife, Amina, gave birth to a boy in the camp just over a week ago. The family of eight has since moved into a two-room dwelling in Sinegodar, but life is still difficult. The OCHA-led assessment mission includes representatives from the UN Children’s Fund (UNICEF), the UN Refugee Agency (UNHCR), the World Food Programme (WFP) and the International Organization for Migration (IOM). It will listen to people such as Agaly, find out how they are coping and what they need to survive. Security is a major concern, and UNHCR is working with the Nigerian Government on plans to move the refugees to safer locations away from the volatile border. However, some are reluctant to move and hope to return to Mali when the situation improves.